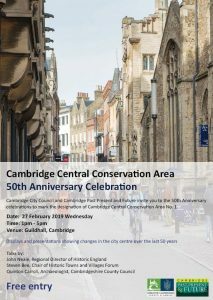 The IHBC is delighted to host a stand as we help the council and local communities celebrate the 50th anniversary of Conservation Areas on Wednesday 27th February, at The Guildhall as Cambridge city centre looks back to its designation back in 1969. Hear about recent archaeological work in Cambridge from the County Archaeologist. Get Historic England’s perspective from the outgoing Regional Director and from Duncan Wilson, the Chief Executive. 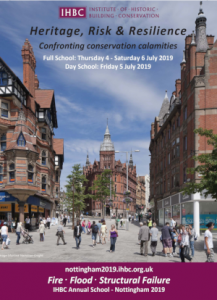 Take the opportunity to hear from Civic Voice, Executive Director – Ian Harvey and the Historic Towns & Villages Forum’s Chair – Steven Bee about the continuing importance of conservation areas. 1-5pm open to all – stalls/displays/talks and, 6pm by invitation – informal reception. Speakers, panel, drinks, buffet. 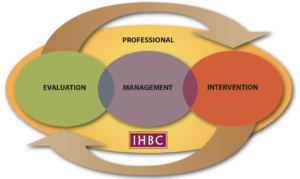 RSVP to Historic.Environment@cambridge.gov.uk by 18th February.